Crane Lake is part of a high-quality, intricate lake system and is a tributary to outstanding resource waters shared by the United States and Canada. Six rare and ecologically sensitive resources are known to be located in the Crane Lake vicinity. settled, raised families and earned a living from the natural resource base of the area. field and high-ground water levels, and improperly constructed septic tanks. Poor receiving soils and inadequate drain fields have resulted in the inadequate treatment of wastewater. Inadequate wastewater treatment has resulted in public health concerns, limited community development and the creation of conditions that may potentially be harmful to the community, environment, groundwater and Crane Lake. 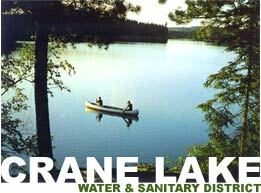 In 1994, St. Louis County formed the Crane Lake Water and Sanitary District (District) and elected a local Board of Managers to address water and wastewater issues in the Crane Lake area. The District is organized under the laws of the State of Minnesota and has authority much like any Minnesota small city, empowered to make and implement matters of public policy and levy taxes to support its operation. Five managers comprise the “Board of Managers” (Board). The Board is appointed by the St. Louis County Board and has specific terms. Residency within the District is required to become appointed to the Board. The District is divided into two sub-areas, the Western Service Area and the Eastern Service Area. Mainly comprising the area from the Vermillion River outlet on Crane Lake along the western shoreline commonly called the “Gold Coast” following County Road 23 south to Handberg Road, along Handberg Road east to Bayside Drive and along Second Street and Hilltop Road.The Board is proposing to construct and operate a municipal wastewater treatment collection and treatment facility for the benefit of the WSA and to upgrade Individual Septic Treatment Systems (ISTS) in the ESA. The WSA system will consist of a septic tank grinder station pumping under pressure to the recirculating sand filter for treatment and a discharge back into the waters of Crane Lake. Prior to discharge, the effluent will pass through an ultraviolet light disinfection unit and have chemical phosphorous removal before discharge. Bear Island, Handberg Road east of Bayside Drive, Rocky Road, East Bay and the balance of Crane Lake.The ESA dwellings will use ISTS through a combination of biological, physical and chemical processes. Cluster systems would unite dwellings where feasible.ISTS would generally consist of a mound, trench or at-grade distribution system. Preferred type of soil treatment depends on local soil conditions and ground water conditions. Site-by-site conditions will be evaluated as well as the evaluation of systems recently constructed to determine compliance with current regulations. No central collection system is planned for the ESA.